Selection of trade cards from the Gwen Goldman African Americana Trade Card Collection. Gift of David Doret. I came to the Library Company of Philadelphia excited to become immersed in the visual culture of the past while an intern in the Print and Photograph Department. I spent June cataloging the Gwen Goldman African Americana Trade Card Collection. 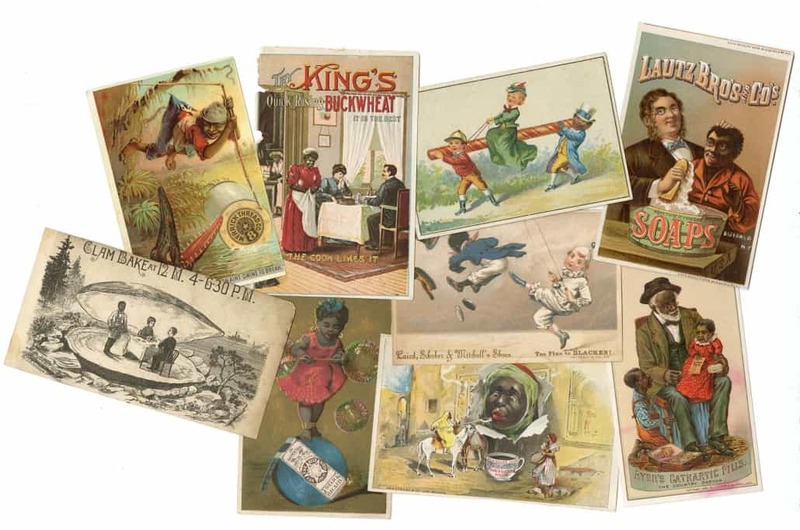 The recently donated collection of 19th-century trade cards and other media represents the roots of modern advertising and the beginnings of Jim Crow-era racism. Trade cards are something like modern business cards. They are brightly colored, widely distributed, and advertise a huge number of products and services. Some of the products we still see constantly advertised: clothing, cleaning products, and medicine. Others seem decidedly archaic or niche: sewing machines, plows, and stove polish. However, the most surprising (and disturbing) element of the cards is not the products advertised, but the images printed on them. The Goldman Collection contains hundreds of images of African Americans, nearly all of them degrading, stereotyped, and racist. Why were caricatures of African Americans so often used in Victorian advertising? Northern cities, where the majority of these cards were produced, witnessed a large increase in the African American population after the Civil War. Many white Americans feared that African Americans would flood the job market with low-cost labor. While slavery had been over for nearly two decades by the heyday of the trade card in the 1880s, societal racism persisted. By satirizing African Americans’ appearance, speech, and actions, white Americans internalized an attitude of racial superiority. Cartoons, blackface performances, and minstrel shows turned Blackness into something harmless, funny, and a means for white hegemony. The cunning publishers of trade cards capitalized on this insidious imagery. The world of trade cards is one in which African Americans are portrayed in demeaning and insulting ways: the country bumpkin, the cheerful servant, the foolish social-climber. Many white consumers may have preferred this world to the increasingly diverse one in which they lived. Then as now, the goal of advertisers was to make money. They produced advertisements that appealed to the masses and sold products, as well as viciously portrayed African American men, women, and children. These trade cards provide a valuable window into the intersection of race, media, and consumer culture at the end of the 19th century. They are an archive that shows the visual culture of the past influences the visual culture of the present. What continuing effect will the imagery of today’s advertisements have in a hundred years? Robert Jay, The Trade Card in Nineteenth Century America (Columbia: University of Missouri Press, 1987). Kyla Wazana Tompkins, Racial Indigestion: Eating Bodies in the Nineteenth Century (New York: New York University Press, 2012).